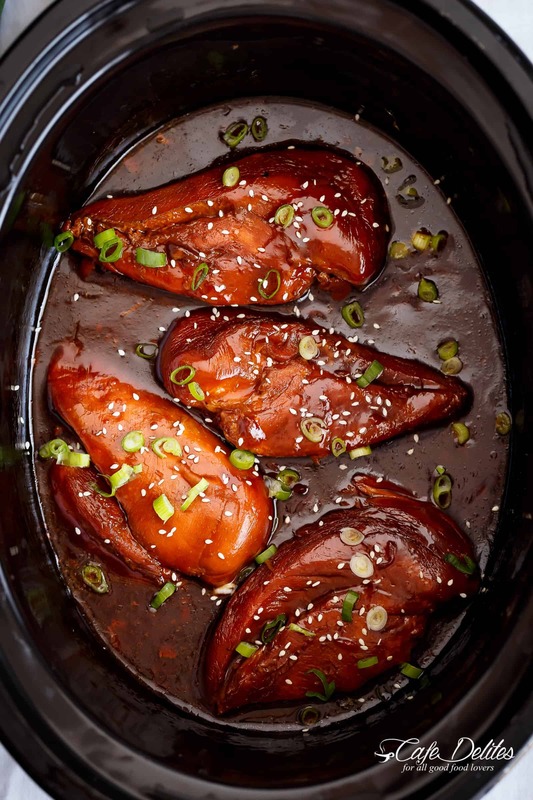 Slow Cooker Asian Glazed Chicken for those ‘throw it all in the slow cooker’ days and let something else worry about your dinner! Fall apart tender chicken breasts (or chicken thighs) filling your house with sweet, honey garlic aromas, perfectly slow cooked and waiting for you when you get home. 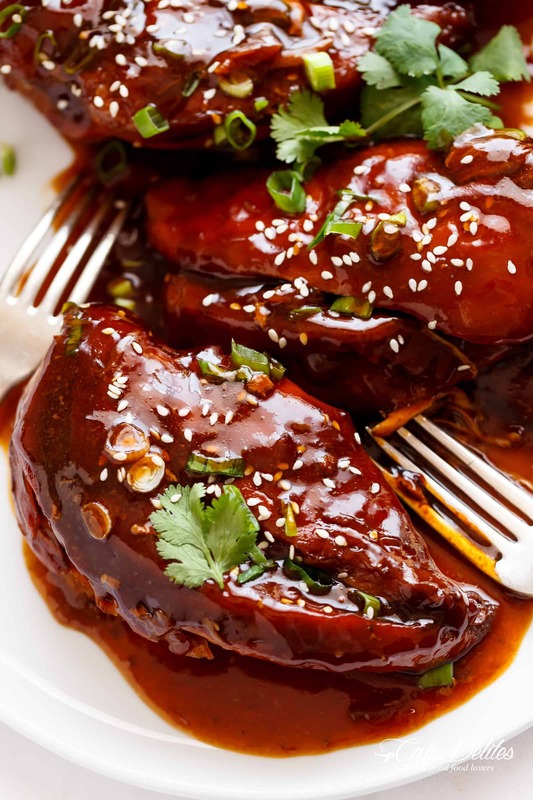 Slow cooker asian glazed chicken! 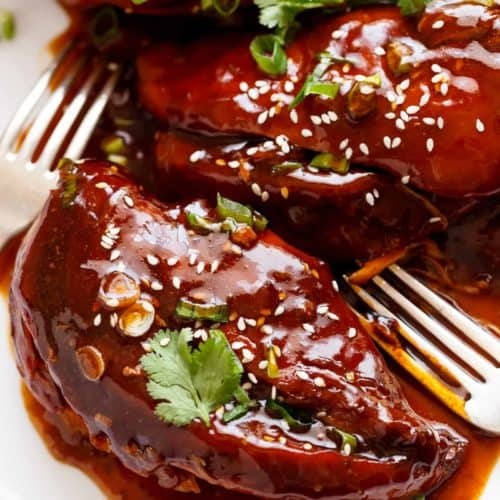 Slow Cooker Asian Glazed Chicken is a no-fail recipe using chicken breast fillets that will have the family (especially kids) crawling to the slow cooker to peer through the glass, wanting and waiting for the slow cooker to finish. The aroma is dizzying. And the taste? The taste is out of this world. Sweet, sticky and mouth-watering: the perfect sweet and salty combination. You only need FOUR main ingredients in the sauce! Originally published on the Best Recipes Website January 29th, 2016. 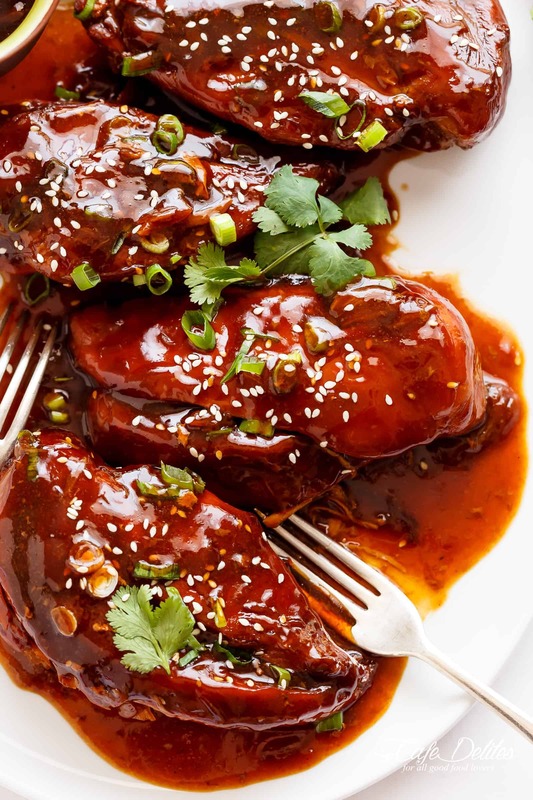 Slow Cooker Asian Glazed Chicken Breasts (or chicken thighs) for those 'throw it all in the slow cooker' days and let something else worry about your dinner! Fall apart tender chicken breast filling your house with sweet, honey garlic aromas, perfectly slow cooked and waiting for you when you get home. 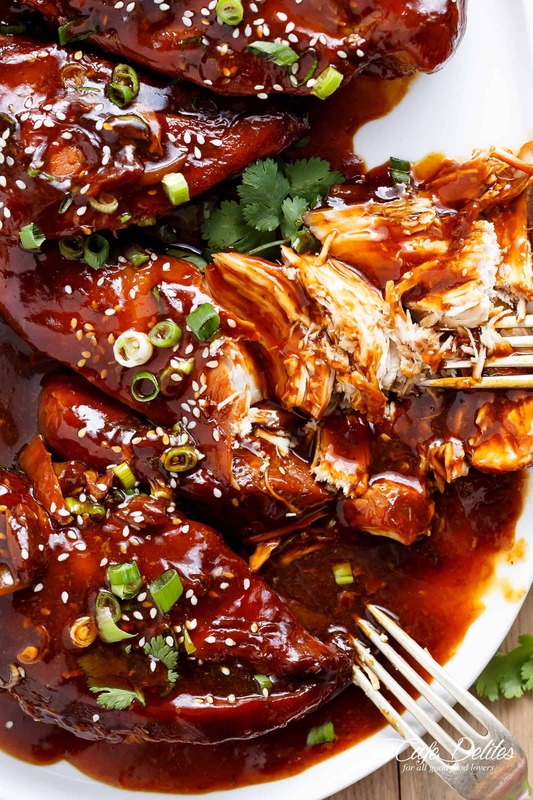 Whisk together the soy sauce, oyster sauce, honey (or brown sugar) and garlic in slow cooker bowl. Place chicken into the sauce, rotating to coat. Cover and cook for 3-4 hours on high or 6-8 hours on low setting. When the sauce is simmering (in the last hour of cooking time), whisk the cornstarch and water together in a small bowl until dissolved. Stir the cornstarch mixture into the sauce; mix it through and cover again to allow to thicken and continue cooking until the chicken is just beginning to fall apart. Taste test, season with salt and pepper if desired. Serve with steamed greens and rice; garnish with sliced green onions and sesame seeds. I don’t have a slow cooker, any other way to prepare this? That is great to hear! I am so glad that you loved it and that it turned out so great! Thanks for sharing! That is great to hear! Thank you so much for sharing and following along with me! I am so glad that everyone liked it and that you tried both glazes. I used chicken tender breasts and cooked it in the oven at 375 for 20 minutes, turning them over at 10 minutes. They were perfect, very tender, and so delicious ! My family would love this dish. What a great way to have BBQ chicken anytime of the year, without all the mess and work. Looks amazing. Will be my go to recipe for BBQ chicken. Thanks for sharing. I don’t know what it is about boneless chicken breast in the slow cooker, but mine always turn out dry, not “fall apart” tender. What am I doing wrong? I have learned never to put water in a slow cooker with chicken. Either chicken stock or some other way of keeping it moist in the bottom. Water seems to always dry out my chicken too. Hope that helps! Enjoy! Can this chicken be cooked in a pot? I dont have a slow cooker. How long do I cook it at low temp to get it meltingly soft? Thank you for posting this easy delicious looking recipe. Yes, that sounds great! I would follow the instructions and cook it on low for an hour. Hope that works! Enjoy! I love the recipes I have made from your emails. On the Asian Chicken is there a product you suggest in lieu of the oyster sauce. I’m allergic to shellfish but would like to try this one. Thank you so much for these amazing recipes. Each and everyone I have tried has been beyond delicious. This site has been a life saver. AWE! Thanks so much! I am so glad that it is a hit for you and it is helping you! Thanks so much for following along with me! This sounds delicious. Do you think it could be done in an Instant Pot (on the pressure cooking setting)? Yes, of course! I haven’t tried it yet but it sounds like a great plan! Let me know how it turns out! Enjoy! Could I use coconut brown sugar or Sukrin brown sugar substitute. As a diabetic I need to keep sugar out of my menus. Yes, that sounds great! It may alter the taste and texture of the chicken though. Hope you enjoy it! Can’t use oyster sauce. Can I substitute hoisin sauce instead? Yes, that sounds great! It may alter the taste a bit but still should taste great! Enjoy! Shrimps delicious and easy !! Thanks ! These Asian Glazed Chicken Filets were amazing! I used boneless thighs instead of breasts but kept everything else the same. Chicken was fall apart delish!! Have shared this recipe with three people already and I cannot wait to make this again. Served the chicken and glaze juice over Basmati rice with buttered green beans on the side! YUMMY!! Thank you!